In which I stop the progression of my pre-diabetes and discover a whole new world of food as medicine at the Weston Price Foundation conference. In order to reverse my pre-diabetes diagnosis I had to openly defy my doctor's orders of the previous year to lower my cholesterol. "They just can't have it both ways," I said to myself. Between cautionary advice regarding heart disease and my new understanding of the role of carbohydrates in raising blood sugar levels there would be nothing left to eat. This is the realization a diabetic is forced to come to given the parameters of the medical establishment and that is how the pharmaceutical companies get you. They already got us with the fear of cardiac arrest putting so many people on statin drugs. And blood pressure medicine. And Lipitor to lower cholesterol. And Prevacid for heartburn. But I was onto them. I had uncovered the Big Fat Lie. Saturated fats, providing they were derived in nature and not by industrial processes, did not make you fat or cause clogged arteries. And cholesterol was necessary for repair to the body especially for women as they aged. But high insulin; now there was a marker for deteriorating health. Not just diabetes, but high blood pressure and Alzheimer's (which was now known as type 3 diabetes because of the role of insulin). My continuing pre-diabetes status would be revealed at my next blood test by the HA1C test. It came back at 5.9 down from 6.0. I had stopped the progression and reversed it, though not by much. I was disappointed given how hard I had worked, but later saw it as a triumph. Considering that I had not yet mastered cortisol levels triggered by flight or flight response, I still had room for improvement. Especially with my public speaking appearances. The three minutes on stage at the conference in Chicago had shot my blood sugar reading 100 points over normal and kept it high most of the weekend. I would learn to master that. The speed at which I had been reading in the last three months had taken a toll on my sleep patterns too, which hadn't helped. And I had spent so much psychic energy building up my case that I had become argumentative at a drop of the hat. But I had diligently monitored my blood sugars and ferreted out the offending foods—toast, oatmeal, potatoes, and the crust on chicken pot pie that rushed into my veins so quickly I felt slightly drunk. I replaced those foods with daily rations of bacon, eggs and avocado. My doctor was noticeably impressed by my work with the blood glucose readings and the food diaries. But my cholesterol was indeed high at 243, up from 189. "Is that what you wanted?" she asked once I had told her why I had taken a high fat approach. "Yes, yes," I said clapping my hands like a child awaiting a treat. High cholesterol was my act of defiance though it still made me nervous, so intense was the propaganda. "But your bad cholesterol is high too," she cautioned. The LDL reading was at 133, up from 102. "Well, according to my reading," I said prepared for this moment of truth, "there are two parts to the bad cholesterol." I waited for her to get it. She agreed that there was and admitted that there was a test to determine whether it was the big, fluffy LDL that protected the arteries or the small, dense LDL that caused damage to the artery. "But there's no point to it," she said about the test, "because there is no treatment for high LDL except diet." "Okay then," I agreed. Diet was, after all, what I was after, not some drug. And so she conceded to prescribe, so that my insurance would pay for it, what I knew to be an expensive test. And would require another fasting blood draw. The test came back in favor of the fluffy protective LDL and Dr. V wrote me a note that I had made my point, but she was still concerned with other factors of my lipid profile. I did not take the bait. I was done with this battle with conventional medicine. After reading Gary Taubes book Good Calories, Bad Calories, I began to hear references to the Weston A. Price Foundation, first from a breast cancer survivor friend of Catherine's, then in the DVD I bought featuring Gary Taubes and finally on the KQED Health Quest show. 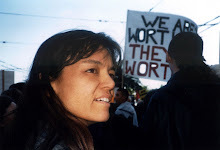 Weston Price was the dentist, who went around the world documenting the diets and health of indigenous people. The foundation was set up to preserve his findings. As it happened, the annual conference was to be held in Santa Clara, a half hour from home not two months after I discovered them. They had never been to the Bay Area before. This was so fortuitous that I felt giddy with the divine providence of it all. The theme of the conference was "Nutrition and Behavior" a rather fitting choice for California's therapy rich culture and would cover ADHD, depression, insomnia and a host of other mental disorders normally relegated to psychology (and often affecting my chronically disorganized clients). I enlisted the support of Joan, the breast cancer survivor friend of Catherine's, who was equally interested in attending. We made our way into the crowded Convention Center, squeezing past displays by vendors of natural health products. There were hundreds of people, possibly 800 attendees, mostly women, a bit younger than us looking fit and healthy in a radiant way. They were also friendly in a family sort of way—the Weston Price family. I was soon to find out that most were practicing nutritionists in a holistic tradition such as Chinese medicine or homeopathy. Also attending were quite a number of psychotherapists, Paleo eaters, an astrologist and a host of farmers and food producers. 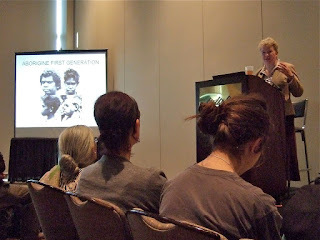 The atmosphere of progressiveness was not unlike Bioneers, the environmental solutions organization in Marin County that Catherine and I attended every year. Except for one thing; it was not dominated by the vegetarian paradigm. The Green Festival, too, had nothing but vegan options in their workshops on food this year. Not a single reference to grass-fed beef being an environmentally tenable solution. This difference at the Weston Price conference created a climate of subversiveness that came up repeatedly in speaker's references to what was held by the public to be healthy, but was understood by the group to fall far short of nourishing and would inevitably lead to failed health. Just the word "low-fat" sent ripples of laughter throughout the room. I laughed too, with relief. It was from one of these speakers that I would learn how coming off a vegetarian diet and onto the Weston Price way of eating would likely send your cholesterol levels high, but it would stabilize over time. These were modern witches, I realized. As subject to patriarchal suppression as the midwives and wise women of the 18th century who were burned at the stake, to be replaced by predominantly male, Church sanctioned doctors. There was no need to burn their modern counterparts, though, for it could be taken for granted that there was little chance people would emerge from the low-fat mantra of conventional wisdom long enough to listen to the heretical message of eating a high-fat diet that included red meat. 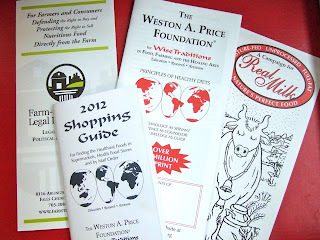 When I first looked at the Weston Price website I thought it was bizarre and queer in a fetishistic sense with all the articles about organ meats and animal fats. But as I became more educated, I was attracted to the very otherness of entering into this world. I was following the path of ancient knowledge. A path that would completely subvert the dominant paradigm of processed foods and factory farmed products. What our industrial food system had done, Sally pointed out, was replace real foods with ersatz foods; foods that had been manipulated by extremes of heat and mechanized processes that so distorted the very molecules of the food that it was no longer recognizable by the body. This included homogenized and pasteurized milk which distorted fat molecules and destroyed beneficial bacteria. Low fat and non fat milk was even worse being ultra-pasteurized. And breakfast cereal was extruded through a machine at such high pressure it rearranged the protein bonds. And factory farmed, nutrient depleted grains stuffed with gluten, causing celiac disease, as referenced in the book Wheat Belly, now a New York Times bestseller. What we once thought of as nutrtitious building blocks of the body, could not be used properly and ended up as unwanted deposits that would cause joint pain, autoimmune diseases, allergies or gastrointestinal disorders. The body no longer recognized what was friend or foe and was attacking these foods and itself. No wonder GMO's were so dangerous. It would just further this process of making foods unrecognizable to the body. It was this unmasking of the food industry that probably gave the Weston Price Foundation the reputation of being extremists, so threatening was it to industrial food suppliers. Weston Price scientists were accused of having far fetched ideas, though they had revealed the dangers of trans fat, long before anyone else realized and were now emphasizing the dangers of polyunsaturated fats. Not to mention the even more contentious subject of unsafe soy—soy that was not prepared in the traditional manner through fermentation to neutralize the harmful phytates and trypsin inhibitors. Practically speaking the Foundation's approach was extreme simply because, in order to eat in this traditional manner, you would very likely have to cook everything from scratch. Such home making skills had begun to disappear from American society just about the time that Home Economics was no longer offered as a degree in college, taking with it the nutrition science behind the cooking skills. It was the mission of the foundation, Sally told us, to make sure that young women who would become mothers had enough knowledge to support good nutrition in themselves and their children. Otherwise, she feared, it would be too late. Entire generations would be born unable to fend off the slightest pathogen and burdened with a long list of allergies. Not to mention being cranky, depressed and mentally unteachable. One of the first observations of Weston Price, the dentist, was that good nutrition resulted in happy, easy going people. His photos often showed people laughing. He made the point that healthy eating was the key to full expression of one's genetic heritage. Thus the women were beautiful with high cheekbones, the men strong with noble faces and the children content, alert and well behaved. They also had perfect teeth without the benefit of either dental care or doctors. He also had pictures of the same tribal people after they had been exposed to modern diets of refined flour and sugar. Their faces had narrowed, their jaws crowding the teeth which were grown in crooked, their demeanor troubled. This was the proof of the pudding as it were. Too much pudding. But the medical establishment put the findings of a dentist and likewise anthropology somewhere so out in left field it was probably viewed more as a quaint hobby, much like history and literature. I already knew that Shamans had brought forth the knowledge of healing plant medicine from communication with the plant spirits themselves; they likely had done the same for the health supporting effects of food. Which would account for how each tribe had their sacred food as Sally was describing. For the little Swiss village isolated in the mountains it was the first butter of Spring, when the cows were returned to pasture after wintering on hay. Internal medicine, by its own admission, was all about bugs and drugs. The body as an entity to be defended from terrorist pathogens with increasingly high tech weapons and the sterilizing of food. Western medicine was to the body what the military was to diplomacy, competent in meeting its objectives, but in an extremely destructive way full of unintended consequences. In the world of Western Price, the body was an organism that was host to billions of micro organisms and the key to health was to boost immunity by keeping good relations with these beneficial bacteria and exposing them to a broad range of more good bacteria. It was also important to insure lots of fat intake to keep the body in good repair. Sally told us she ate 70% of her calories in fats. Her picture of half a stick of butter on a short stack of pancakes made us laugh. Indigenous people ate animals in reverse order to modern people we learned. The muscle meat we moderns were so fond of was left until last and often fed to the dogs. The most important part of the animal was the head, the internal organs and the bones. This was the world of bone broths and liver for strong bones and cell structure, while fermented vegetables and raw milk provided good bacteria. Probiotics was the word of the day. A colleague introduced me to raw milk a few weeks before I got to the conference. She told me how, even though I was lactose intolerant I might very well be able to consume raw milk just fine, because the enzyme lactase is destroyed by pasteurization and this is the very enzyme needed to help digest the lactose sugars in milk. Thus raw milk helped you digest it. How brilliant is that? That unpasteurized milk was known for food born pathogens like e-coli made me slightly nervous, so she went with me to Rainbow Grocery to help me buy my first pint of whole fat, raw milk. It was deliciously sweet and full bodied. She also recommended the book The Raw Milk Revolution: Behind America's Emerging Battle Over Food Rights, in which an investigative journalist ferrets out the real story behind the harassment of raw milk suppliers. Now I drank my raw milk with impunity as an activist supporting food rights, but I was also curious to see what health benefits it might offer. And yes, it did not give me gas like regular milk did. Raw milk enthusiasts claimed that it cured asthma, Asperger's symptoms, ADHD, sent cancer into remission and fixed digestion problems. Like good chicken broth it had the power to boost the immune system and fight off colds. The connection between raw milk and less asthma in children had been documented, but science on the whole, was bent to serve the bias against raw milk and other unpasteurized foods. I recalled from earlier readings on globalization how Raj Patel, in his book Stuffed and Starved, had pointed out that the most profit to be had in the food supply was at the point where it went through the most expensive processing because of the industrial machinery involved. Farmers couldn't afford such machinery, but investors could profit intensely from owning such machines. Unpasteurized foods meant more direct access to farmers and like the Church and God, it simply wouldn't do to make it so easy for ordinary people to have such access to fresh foods or the Divine. It cut out the profits of the middle man and diminished the self-importance of the medical establishment and its dogma against pathogens. Destroying bacteria was also necessary for longer shelf life so served the food processing industry as well. 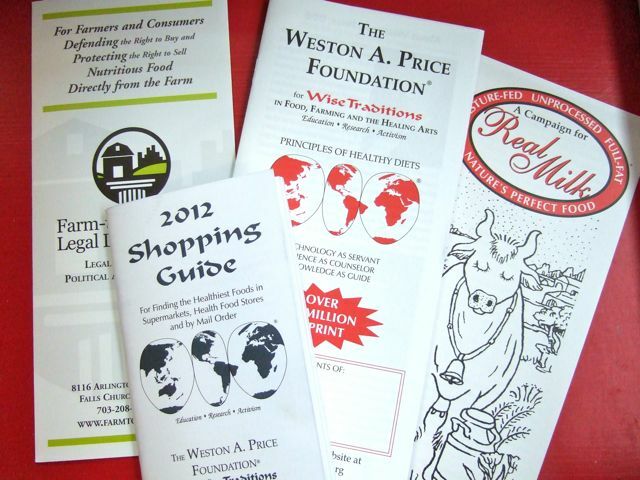 So important was raw milk to the Weston Price ethic, that it had started the Farm-to-Consumer Legal Defense Fund to protect the raw milk farmers from this constant harassment from food authorities. They also founded the Raw Milk Institute to help farmers establish uniformity of standards. A vigorous two week restorative diet was prescribed that restricted all starches and complex carbohydrates. Bone broth ensued to heal the gut lining. Other animal products were enlisted for nourishment. After which you could begin to introduce diary and other more challenging foods. I would never look at a mental disorder again without thinking of gut flora. In another room Julia Ross, a psychotherapist and author of The Diet Cure and The Mood Cure, also mentioned GAPS syndrome in her talk on the connection between body and sugar. She linked the onset of not only obesity and diabetes with an increase in sugar in the American diet, but also depression, anxiety, ADHD and insomnia. In combination with the low-fat obsession of our culture we were being severely undernourished. Sugar (and chocolate) was a form of self-medication for low levels of serotonin and hypoglycemia to prevent the brain from crashing. But it also rewarded the dopamine pathways which made sugar four times more addictive than cocaine. In combination with casein in milk products it created an opiate response. Thus the comfort foods like mac and cheese. Such a high sugar diet led to nutrient depletion. But amazingly a cupful of amino acids could correct the neurotransmitter deficits and stop the cravings in about ten minutes. Supplements of tryptophan and another amino acid—5-htp would help the body make serotonin. An appropriate diet would restore the natural body chemistry. These stories offered hopeful alternatives to the pharmaceutical bandaid. In my travels food was seldom connected with mental health. People wanted quick fixes, but now more were fed up with pharmaceuticals and side effects so slowly these homeopathic methods were gaining in popularity. The nutritionists and homeopaths were reporting that they needed to do less outreach since more people were coming to them. I also attended a talk on diabetes. This disease was so much a part of the health and diet spectrum that they had a session on it every year. The speaker was a medical doctor who had adopted the homeopathic approach. I was intrigued to find that there were homeopathic remedies and missing ingredients like glutathione and glutamine to look into. She advised liver twice a week and a high fat, starch free diet. In fact 60 to 80% of the diabetic diet was to be from fats. I was vindicated. And forget about those wheat grass green drinks and raw food diet which had been recommended to me more than a few times. It might lower blood sugar impressively, but the diet just didn't offer the necessary nourishment. 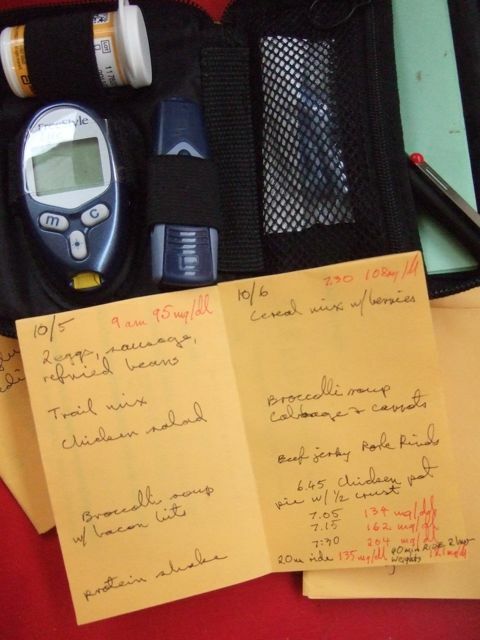 Before I received this pre-diabetes diagnosis, I had often said I wanted to know more about nutrition to obtain optimal health. I just didn't know where to begin. Having been pulled into this research through an insulin related disease, I couldn't have asked for a better portal. Probably had asked for it given how these things worked. I left the conference with my brain turned inside out. The whole world was going to look very different through this lens.